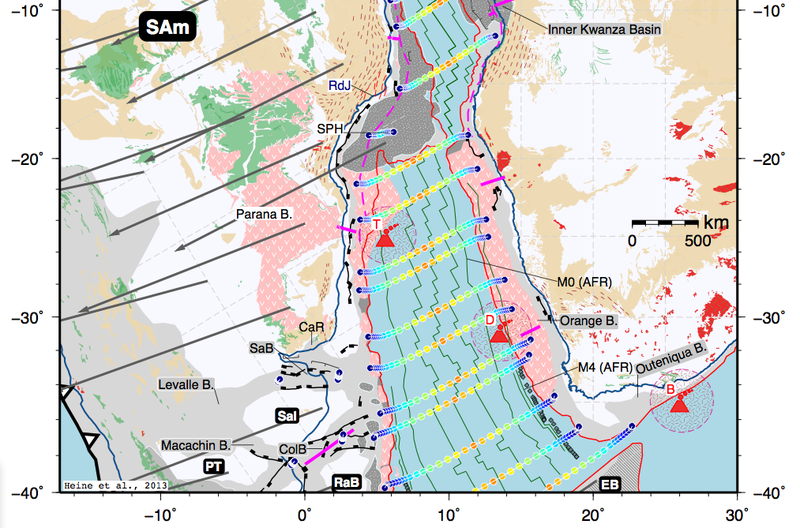 Plate tectonic reconstructions require to have some present-day markers so that any person reading or looking at the results can correlate the paleo plate positions and continents with present day. Things did indeed look quite a bit different back then… Usually the present-day coastlines are used a such a marker, but as sealevel has varied extensively over the geological history, displaying an Early Cretaceous reconstruction at, say 110 Million years, with present-day shorelines might be a bit misleading. In fact one could probably say that it is plainly wrong. So what’s the big deal about this you might ask. One key aspect of graticules is usually that they are not “features” in the sense of tangible geospatial data, but rather a “decorative” overlay. 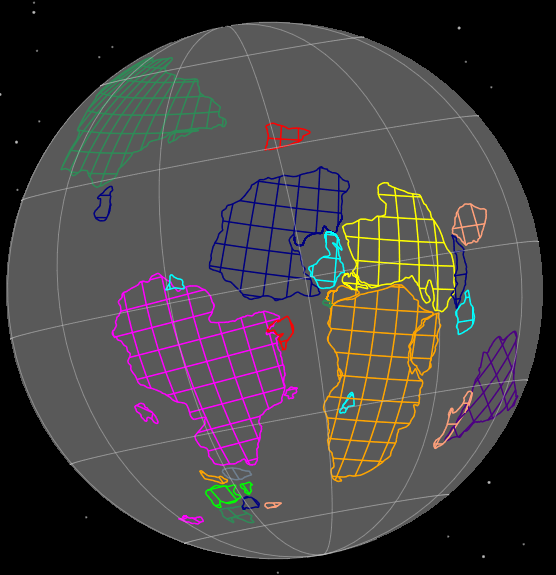 GPlates also displays a fixed graticule (the thin gray lines spaced at 30 degrees) on the globe. However, in plate tectonics, if we go back in time, we require that such lines and decorations become ‘reconstructable’ back through geological history. So we need data, not decorations. During the 1980’s in the famous PLATES project at UTIG, a special data type called ‘Gridmarks’ was invented which was pretty much a set of crosshairs, centered at equally spaced increments, mimicking a graticule which could be reconstructed. Take these individual crosshairs, assign them a lifespan and a PlateID and one could simply reconstruct them as continental outlines and other geospatial features were. All worked quite happily with this concept and this old file. When I started to work on South Atlantic plate kinematics, I realised that, albeit being quite useful, some smaller plates would simply be missed by the grid marks. Also, one would also have to reassign plate ids for any new set of polygons one is working with and sometimes a bit of an update to the way things are being done is also refreshing. The routines which were used to generate these gridmark files (in the old PLATES *.dat format) were written in Fortran and I don’t have a compiled version for my OS at hand and knowing the pain associated with this exercise I opted for a writing a new routine from scratch in Python tailored for use with GPlates. Graticule lines feature collection showing a 1-degree graticule covering most of Europe. Note that all lines are individual features. 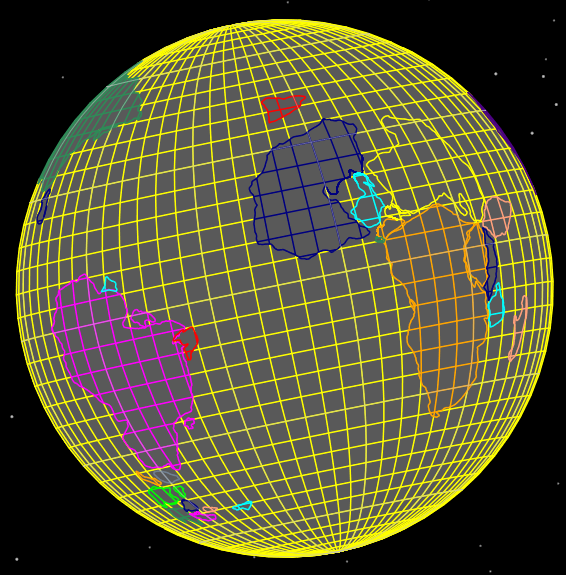 A global graticule (using the default settings) cookie-cut and age-assigned along with plate polygons. 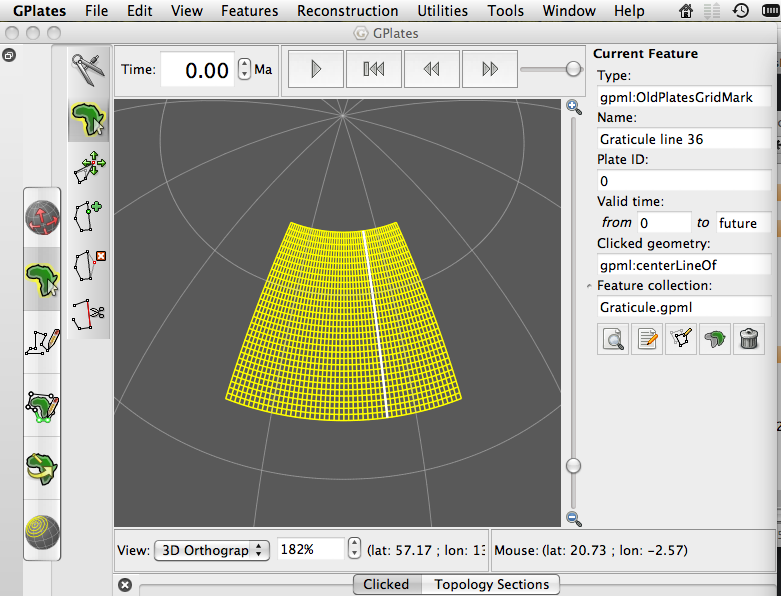 Graticule lines as reconstructable features – cookie cut to plate polygons and rotated back to 100 Ma. Similarly, this will also work when using GPlates’ SVG export. You can of course also export your graticule file in GPlates to different formats – such as ESRI Shapefile or OGR GMT plain text format (“Save as” functionality in GPlates’ feature manager). Happy map making. For bug reports and improvement suggestions please use the BitBucket issue tracker or the commenting functionality here. This entry was posted in Geo-Hacks, GPlates and tagged GPlates, Mapping, Plate reconstructions, Plate tectonics on 28/06/2013 by Christian. The content (images, animations and text) of this blog are licensed under a Creative Commons Attribution-NonCommercial-ShareAlike 4.0 International License unless stated otherwise. If you would like to use content in a commercial setting, please get in touch using the contact form on the About page. Rifts III – Catching the wave!